March 17, 2018 This post may contain affiliate links. The question I get asked a lot is this: What are the Rules of Clean Eating? So I thought I would put them together on this handy little printable. There are and always will be variations in what people consider Clean Eating and it does depend on how rigid you are when it comes to your diet. For our family, Clean Eating was a way to improve our health whilst eating good quality food and being accountable for where it came from. It isn’t overly restrictive but it does focus on eating Real Food. After a lot of thought, I came up with these 12 guiding principles. EAT REAL FOOD EVERY DAY. Real foods are whole, single ingredient produce that exist naturally like whole fruits and vegetables, or proteins from animals raised on farms or sea life living in the Ocean. Real food is an ingredient. It doesn’t have a label or a list. It’s a simple whole food like broccoli, chicken, milk, tomato. We combine these real food ingredients to create clean, real food recipes. If you are buying pre-made or packaged food, then read the label. Make sure you can identify every ingredient on the list as a Real Food ingredient. Avoid eating food that has numbers or chemicals in the ingredient list. If you can’t read it then put it back. Avoid foods with added sugar and artificial sweeteners. If you need to add sugar, skip the refined sugars and rather add a natural sugar alternative at home, like honey or maple syrup. Be in control of the quantity you eat. Know where your food comes from and take accountability for its journey from its origins to our plate. Choose humanely produced, free range meats, sustainable seafood and organic whenever possible. 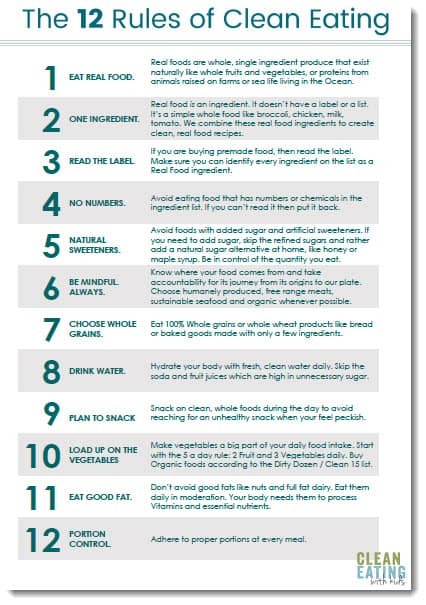 Eat 100% Whole grains or whole wheat products like bread or baked goods made with only a few ingredients. Remember Rule #3. Hydrate your body with fresh, clean water daily. Skip the soda and fruit juices which are high in unnecessary sugar. Keep your home a Water only zone and keep the crap out your kitchen. Snack on clean, whole foods during the day to avoid reaching for an unhealthy snack when your feel peckish. Plan your snacks weekly and keep a list on the fridge so you are never stuck on what to eat. Make vegetables a big part of your daily food intake. Start with the 5 a day rule: 2 Fruit and 3 Vegetables daily. Buy Organic foods according to the Dirty Dozen / Clean 15 list. Don’t avoid good fats like nuts and full fat dairy. Eat them daily in moderation. Your body needs them to process Vitamins and essential nutrients. Adhere to proper portions at every meal. Click on the image below to download the 12 Clean Eating Rules. Your download should start immediately. Let me know if you have any issues opening (I’m still learning the tech thing:). I have a ton of printables on CEWK, so I decided to keep them all in one place so you don’t have to fill in your email address to get each one. Nobody likes that.